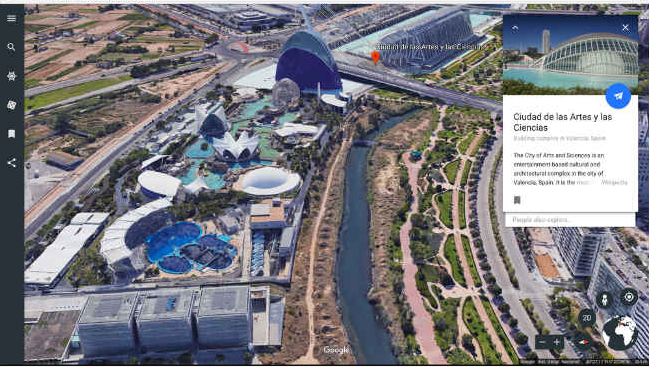 The Brand new version of Google earth was released on 18th April 2017, the first thing to know is that the new version is designed to be used entirely in the chrome web browser and will probably start rolling out for Android users this week. It will be coming to IOS and other browsers in the near future. The new version of Google Earth is really cool but its most important update is the new 3D mapping feature. It has a 3D button that allows users to see any place from any angle. Bringing all this to life is Google’s fantastic new 3D map system, which is available for major landmarks across the globe. The high-resolution 3D maps provide photo realistic bird’s eye view of various locations around the world, whether it’s The Taj Mahal in Agra or The India Gate in New Delhi. When you search your place on Google map there is an icon on the left-hand side that displays the text I’m feeling Lucky, just click on it. On the right-hand side it will show a little information card that gives you some fun facts about that location, now keep in mind that the information is being drawn from Wikipedia. It also shows you the most interesting places and the most popular places for tourism. You can see more places after scrolling through a little slideshow of interesting places. Next features that are new in Google Earth is the Navigator or Voyager. It shows you the view of a street in 360 degrees. Just drag the street view icon and drop them onto any of those blue lines and you’ll be taken to the street view of that location. These are the latest new updates by Google that easily allow you to view places of your choice. Consequences of Artificial Intelligence: A Threat or Solution?